QUNU, South Africa, Dec 15 2013 (IPS) - As South Africa’s first black president, Nelson Mandela, was laid to rest at his childhood home of Qunu in the Eastern Cape, Malawi’s President Joyce Banda told mourners that it was Mandela who taught her how to forgive those who tried to keep her from becoming southern Africa’s first female head of state. Speaking at the funeral on Sunday, Dec. 15, Banda said she had been deeply moved by Mandela’s life before she had even met him. 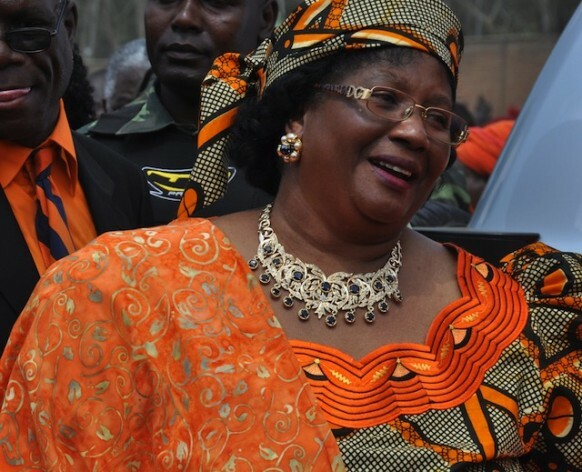 She told mourners that she had a moving conversation with the world’s most prominent statesman just months before she was to become president of Malawi in 2011. “I was deeply touched by his spirit of forgiveness, his passion to put people first, and his courage. These attributes have greatly influenced my life,” Banda told mourners who included U.S. talk show host Oprah Winfrey, entrepreneur Richard Branson, the United Kingdom’s Prince Charles, and American civil rights campaigner Reverend Jesse Jackson. Mandela died on Dec. 5, after a long illness. He was 95 years old. “At that moment I did not know that I was to become president of the Republic of Malawi a few months down the line. At that moment [before] I had become president of Malawi I had been isolated, humiliated, called names and escaped an assassination attempt on my life. I found myself in a situation where I had to work with those same people who prevented me from becoming president of my country,” Banda said. When Malawi’s President Bingu wa Mutharika died in April 2011, Banda, who had been named Mutharika’s running mate in 2009, had been expelled from the ruling Democratic Progressive Party and was isolated politically. At the time of Mutharika’s death she remained the country’s vice-president and his successor. However, some within Mutharika’s inner circle had attempted to delay announcing news of his passing to ensure that his brother, Peter, could take over the presidency. They failed. “I had to forgive, but I had to forgive without any effort because my Madiba [Mandela’s clan name] had prepared me,” said Banda to wild applause from the audience. Malawi’s director of information, Chikumbutso Mtumondzi, told IPS after the speech that Banda’s humility made her a champion of Malawi’s vulnerable. “She has learnt a lot from watching and reading about Mandela’s leadership style and this is being seen in how she is working with her adversaries and helping the poor,” he said in a telephone interview. “She demonstrated forgiveness by re-appointing the same ministers who plotted to stop her from ascending to power constitutionally following the death of President Mutharika. She is building houses for the poor and looks after so many disadvantaged children,” he said. Banda took a personal pay cut of 30 percent and put her predecessor’s private jet up for sale after she came to power. She moved to restore donor confidence in Malawi by implementing an austerity budget, promising poverty reduction and justice for the disadvantaged. But Banda, voted by Forbes magazine as Africa’s most influential woman, said she learned from Mandela’s example. “I learned that leadership is about failing in love with the people that you serve and the people falling in love with you…we will remember Tata as a great reformer who championed democracy and dedicated his life to selfless service,” she said. “In the SADC region we remember Tata [Mandela] as a great reformer who championed the cause of humanity, deepened democracy and dedicated his life to selfless service. A man who worked tirelessly to promote national, regional and world peace…. The ideals of political, social and economic emancipation that [he] stood for will inspire us forever as a region,” she promised. African Union chair, Ethiopian Prime Minister Hailemariam Desalegn, pledged to continue with the ideals that Mandela believed in. “Humanity is better off because it had the good fortune of having Mandela…the champion of peace and justice and we pledge to continue with those ideals,” he said. Mandela’s flag-draped casket left Pretoria on Saturday, Dec. 14, after lying in state for three days. It was accompanied by a military guard of honour and was flown to Qunu after a solemn ceremony at the Waterkloof Airforce Base, organised by the ruling African National Congress. Mandela, hailed for leading South Africa out of decades of apartheid, became the first icon from a line of famous South African anti-apartheid heroes like Chris Hani, Govan Mbeki, and Steve Biko, all of whom were from the Eastern Cape, to be buried in his ancestral home. 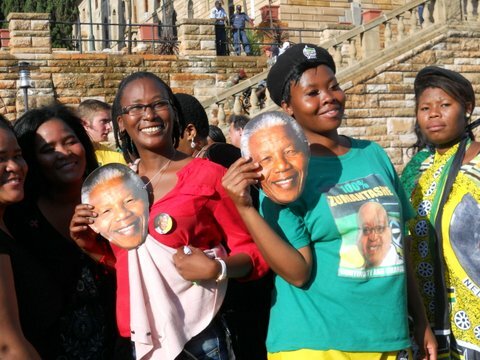 Thousands of invited guests arrived at the rural village for Mandela’s burial. A dome-shaped marque, constructed for the ceremony, transformed the little village, which from now on will be known globally as Mandela’s final resting place. Military jets and helicopters hovered in the skies and access to the compound, perched on a hilltop overlooking the traditional village homes, was restricted to family members, a few relatives and invited guests. “He was the best thing that ever happened to South Africa,” said Gideon Nasilele, who was among the thousands who travelled to Qunu to pay their last respects to Mandela. “He was a man of incomparable vision and a hero for so many of us…his death leaves a huge power vacuum in South Africa,” Nasilele told IPS.